Reminiscent of a traditional Cretan village and situated in a beautiful beachside location overlooking Mirabello beach, the Candia Park offers a perfect setting for couples and families seeking a relaxing holiday. About an hour from Heraklion airport this hotel is built in traditional cretan village style with small apartments only 2 stories high. We felt this was far more attractive than a high rise hotel. We were allocated apartment 132 which was on the ground floor a short walk away from the main restaurant/pool area. There was a very good size twin bedroom and the children slept in the lounge/kitchen area on a comfortable twin sofa bed. The kitchen had fridge with icebox, coffee maker, kettle, toaster, 2 ring gas hob and some basic utensils - enough to cook light meals. Washing brush, soap and tea towels are provided. The outside patio area was a good size and cool and shady. As we have young children it was perfect. Would imagine it would have been a bit of a trek back up from the pool everyday if you have one of the rooms further up the village near to reception so if we went back we would definitely specify a room near the pool/restaurant. The cleaners knocked on our door at 9am for the 1st 5 days before they twigged that we were having breakfast in our room at that time so would need to come back later. They seemed most put out that we were breakfasting in our room and they couldn't get in. I say 'cleaners' but use that term loosely. Other than making the beds and changing our towels when required the room didn't appear to have been cleaned. One leaf on our bathroom floor stayed there the whole 2 weeks. We deliberately didn't bin it ourselves just to see what happened!! The room was very clean when we got there and I kept the kitchen area clean so it wasn't too much of a problem. All other staff at the hotel were great - efficient, helpful and friendly. The only other slight downside to this hotel is the location. To get into Ag Nik you have to walk to the top of the village complex to the main road and either get a taxi for 8 euros or a bus for 4 euros 20 for 2 adults and 2 children. It really isn't close enough to walk into Ag Nik with 2 young children though if you have older children you might want to walk down to some of the tavernas on the road into Ag Nik. You can't just stroll into town in 5mins it would take at least 50mins and in the heat this would be a long walk. We went self catering so tended to eat breakfast and lunch in our room then either eat out in Ag Nik for dinner or at the on site Taverna Fili. We can thoroughly recommend the on site taverna. Pricewise it is comparable with what you'll find around the town if not cheaper and the food and service were great. Eg plate of fries 2 euro glass of wine 3 euro. We didn't eat in the main restaurant as the reason we had gone self catering this year was to avoid the buffet style hotel dinners where the food is average and all the kids eat is chips! Having said that it was very busy so can only assume the food was ok. At 20 euros for adults and 5 for children this is not necessarily a cheap option. There are 2 really great sized pools, a baby pool and an excellent lifeguard service. We tended to use the top pool as it was better suited to our childrens swimming ability. The top pool has a jacuzzi feature at one end which the kids loved! All pool areas and restaurants were kept very clean and the first thing the lifeguard did every day was take water samples from each pool. We never had any problems getting sun loungers although as the hotel got busier I could see that this may be a problem with people reserving sun loungers before 9am every day. A beach towel exchange service operates 10am - 6pm next to the deep end of the bottom pool. The hotel also has a small private beach with a shady terraced area with sunloungers. This was fine while we were there but may be a bit crowded when the hotel is full. We never actually left our children in the free hotel kids club although we did go into the mini club room with them and do some colouring and face painting. The kids club staff were very friendly and quite happy for you to be with your children and wander in and out of the club house as you liked. The play area was nice and shady and big enough for lots of children to use at one time. The on site supermarket is not as large as it perhaps could be with a hotel this size though you can easily buy the basics you need for breakfast and lunch. As expected for an on site shop the prices are more than you would pay in one of the shops in town but for convenience its fine. A word of warning though - 3 days out of the 14 they didn't have any bread. We had other stuff on those days eg crackers etc but if you have fussy children who only eat bread it could be a problem! The car hire company SixT have an on site rep who was extremely helpful. We hired a car for 6 days which did enable us to get out of the hotel however at around 70 euros a day it wasn't cheap. You could probably get a better deal getting the bus into Ag Nik and going to one of the many hire companies there however for us we were happy to pay for the convenience of the on site rep. Not really about the hotel but the car was relatively new and 2 booster seats for the children were relatively new and in good condition - our other main requirement in car hire! Overall I would say this hotel has a lot to recommend it. The only negative is not being able to go for a stroll into town very easily. If you like to stay in the hotel its an excellent choice - we probably could have quite easily eaten in the Taverna most nights and been happy with the variety. However to really make the most of it do try and get into Ag Nik at least a couple of times or even better hire a car or go on organised trips to see the island!! We have just returned from crete after staying at the Candia village appartments on a self catering basis. The room we had was for four so we had plenty of room with a very good size balcony. Maid service was good although they could call at any time even though many appartments were empty. All the staff were very helpful and the complex was very clean and tidy. The hotel food was expensive but you could walk to the town if you felt brave.We found it took about an hour to get to the main town or twenty mins to get to a good restaurant or supermarket.If you stand at a bus stop you can often get a taxi at a cheaper rate. Overall an excellent place if you are happy just relaxing rather than getting out and about.A bus stops at the entrance but not many punters seemed to use it. On the way to town you past Restaurant Delta.This is the only place I have had a side plate with a smear of faeces on it. When we were at Candia we found it to be very cosmopolitan with many nationalities staying there. If you dont like kids dont come .We are tolerant but I could see some not being too happy with kids running about in the restaurant whilst you are eating. Just returned from a very enjoyable stay at the Candia Park. The laid-back style of the hotel is perfect for the family. Our room was one of the "superior" rooms ie 60 square metres, and it was very spacious, light and airy with excellent air conditioning. The maid service was very good, all facilities great. The pool areas are very good, plenty of beds so no need to get up at 0700 to claim them, towels provided by the hotel so no need to pack any either. Hotel food was of a high standard, and the theme nights were good, but do not believe that the various nights on offer(Bouzouki, Mediterranean etc) are that different - once you've done one, the others are almost identical in terms of the food served. Entertainment was reasonable, a band played most nights along various themed lines (Rock, traditional etc). My only issue with the place is the location - because it is nestled in the hillside between Ag Nik and Elounda, you are captive - there are no bars or supermarkets within walking distance so you are restricted to the limited range, high prices and opening times of the hotel supermarket. Unless you hire a car, you are reliant on taxis to get anywhere. This process can be a bit fraught at times, especially around 8pm when there are invariably 6 or 7 families trying to travel at the same time, and the taxi firm can't cope. We waited an hour for a taxi one evening, so I'd recommend taxiing to the towns before 8pm if you can. With 6 days to go on the holiday, we were approach by the hotel with an offer to upgrade to one of the seafront rooms (they needed our larger room for a big party coming in) for free. We did this, and I have to say that next time I would consider booking for one of these rooms - they look straight out over the bay, and have a small beach area which is more private than the main beach - a very relacing place to be. One more note of caution, there was an incident while we were there of some children being pulled unconscious from the pool - I won't go into detail, suffice to say do not rely on the Lifeguard service. Overall, a very well-run, very clean hotel, great for the family, lots for the kids to do, will definitely consider a return. We have just returned from Candia Park after a fabulous 2 weeks. Transfer was a bit long as we arrived at 4am and after stop offs we reached village at 6am. On booking we had upgraded to a one bed apartment. On arrival this was not ready so they put us in a studio so we could have a sleep and they would move us later that morning. First impression was that the studios were lovely, spacious and clean (so what must the one bed apt be like). They moved us about 11am, the only difference was the apt had a wall separating the two rooms. We thought the studio was better as air con would flow through the whole room (speaking to people in 1 bed apt said bedroom was cool but other room got quite hot at night) and as our children are only 6 and 5 yrs they would be in our room, so we asked reception if we could move back to the studio which they let us and even asked if we wanted the porter to help us. Later through the holiday they refunded us 120 euro for the difference of the down grade which we did not expect as it was our choice. The reception staff were very friendly and would do anything to help. They would phone for taxi for you to visit Aghios Nikolaos or Elounda. Food is good they have a buffet lounge/ a el carte which you can pay at or they have a taverna which is not bad but prices are quite high eg Greek salad 7.50 euro but in aghios Niko or elounda it was between 3.50 - 4.50 euro and you can have a much better meal in either one of the two resorts loads of bars restaurants and shops in each. The village was set out beautifully with the apartments set out in blocks of 4 facing another 4 with cobbled pathways lines with shrubs and flowers taking you through the village. There were 2 pools one fresh water and the other salt water the fresh one seemed to be more packed with people jumping in and playing Water volley so we stuck to the saltwater. Pools and pool area were always kept clean. On arrival you get towel vouchers and each day you give them in and get a fresh towel for either use at the pool or the beach. Bed were not to bad to get but if you wanted the same area you had to get up early to get one about 8.30 - 9am. The main bar (Eros) can take at times about 15 - 20min to get your drinks as the services is not that great even if you go to the bar yourself and order. Service in the taverna (fili) seems to be quicker. The children's club was very well run our 6 year old daughter went a few times and made some great things, each day they had a time table of activities which you could drop in on any of them you did not have to stay for the whole day. The girls that run it were very helpful and friendly. Entertainment of an evening was Cretian night, magic Tony (kids loved magic show) Two guys play rock/pop music and other nights was a guy playing an organ. 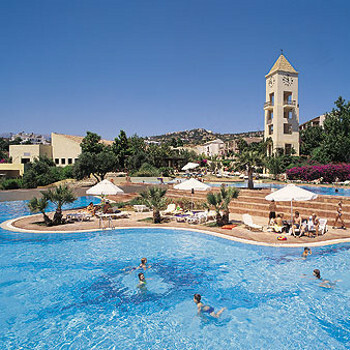 Candia Park Village, Aghios Nickoloas, Crete. We stayed self catering, however the majority of other companies provided half board. We had a one bedroomed apartment, the kitchen area which was in the same room as were the children slept consisted of two gas rings, sink and fridge and quite honestly this is all we needed. We had regular maid service and the linen changes were frequent. What was a particular bonus was the fact that beach towels were provided and changed regularly. Airconditioning in the bedroom but if you kept the door opened it would cool the whole apartment. You need to take a loyalty card or stiff carboard to leave in the slot to keep the air conditioning on as it was operated by your key fob. The hotel was very clean and the public areas a delight. The gardens were well maintained with beautiful flowers and plenty of lime trees. Plenty of sunbeds and a life guard on duty at the pools. The smaller pool is freshwater and therefore more popular with the children. The very large free form pool has two diving boards with one very deep end and a shallow end. This is seawater. Neither pools appeared overcrowded. The beach area although small is lovely. There is another beach area as well with a jetty which provided amusement for jumping off. We had bought our own breakfast with us but ate on four occasions at the hotel. Their theme buffet nights were 22 Euros for the adults and 6 for the children, but the food was excellent. A buffet selection including barbeque foods. As much as you could eat. Drinks were pricey but we had stocked up at the Spar supermarket in the town and placed the drinks in our fridge. The hotel location we found a bit limiting which was the only small criticism. You would have to get a taxi or bus to the town. The taxi cost 6.5 euros each way (fixed fare). However the buses run frequently and cost 1 euro per adult. Just don't get to the bus stop too early generally they are always 20 minutes late. We got the bus to Elounda on several occasions 3 euros for 2 adults and 2 children. A taxi would cost 10 Euros. The buses are airconditioned and the conductor comes around to collect your fare. Excellent. The walk to town takes at least 45 minutes in high heat and the round is not particularly safe. The drive is a corkscrew drive to the entrance of the hotel and you must find out the short cut to save time. Entertainment is very low key, a couple of greek nights each week and a pianist. We did miss out on entertainment but we knew before we went it would be low key. The children enjoyed the playground and the 7 year old girl enjoyed the kids club. This is hotel run but the TUI rep was also there and did not exclude any of the children. We would visit the hotel again at some point in the future. We tend not to revisit resorts but whilst we were there we got talking to several repeat visitors and other guests were already planning their return. Candia Park Village sits on the side of a hill overlooking the sea about 6km from the town of Aghios Nikolaios, a short taxi ride away. As the name suggests, the apartments are set out like a village, in a typical Mediterranean style. The standard apartments are fairly basic but clean, well maintained and attractive. Nicely landscaped and well planted surroundings. The pool area is quite big, with one very large sea-water pool, a freshwater pool and a kids pool. Plenty of room, we always found sunbeds even if arriving there late. Pool bar for drinks and ice creams. The beach is down some steps, again there are sunbeds and also watersports available, and tennis courts. There is a a well-stocked supermarket, a gift shop, a cafe (Kafeinon) and laundry. We took the half-board option and the food was excellent. Breakfast: self service buffet - lots to choose from. Dinner: starter (soup or juice), then self-service buffet (hot and cold food and salads) and then your menu choice of main course, followed by dessert. Very easy to over-eat, and plenty of choice. During our 10 night stay there were three themed evenings, Bouzouki night, Cretan night and Mediterranean night.On these evenings there was a self service buffet with an amazing array of food, all well presented, something for everyone. Entertainment focussed on traditional Cretan and Greek music with dancers on the themed evenings (audience participation optional) and a band or pianist on the other evenings. Finished about 10pm, so not too late for small children. There is a taverna, where you could have lunch, or your evening meal if you wanted. Once again, good food. The hotel staff are very polite and helpful, nothing was too much trouble. Overall I would say it's clean, in a good location, and ideal for kids. Older teenagers may find it quiet, but there's always the town to go into. We are definitely going back! Our holiday at Candia Park was one of our best holidays ever.Our appartment was basic and simple, but had all the essentials needed for a self catering appartment(mini grill,toaster etc).Our appartment was cleaned everyday, the cleaners did a fantastic job, for which we thank them.We did have one problem with our appartment,we had a really bad mosquito problem,but that was for our specific appartment it does not apply for the rest of the village. Fantastic pool. We always managed to get sunbeds,(and we needed 6! )A fresh water pool and a seawater pool, both very large.Also a good size childrens pool, reaching 0.80m in depth, which is the perfect depth for young children.Tiles placed around pool, which could get slippery, but you're not going to place anything else around a pool are you? Perfect location,next to the beach. The beach itself was an adequate size with pebbles going into the sea up to about waist hight.My son and husband would highly recomend the watersports! We have been to Candia Park twice now and we will be enjoying our 3rd visit in August 2005. The location is good and not too far away from the town. There's a short cut through to the main road which cuts off 15minutes of walking time so it's a nice 40minute walk or 6euros for a taxi. We went self catering because we like to try different restaurants. The food at the hotel was good we stayed and ate there when they had the bbq nights, all you could eat and entertainment too. Really good nights and because we had been there before we got free wine at our room and a invitation to a free bbq night as a thank you for coming back to them. The staff were great they were friendly and helpful. The rooms are cleaned everyday, as are the towels, air conditioned rooms. Pool is great with 2 diving boards. This was our 3rd stay at the Candia Park. I wish we were going back this year but felt we must have a change. It is deffinately the best place to go if you are looking for peace and relaxation, good food, and big beach towels supplied by the hotel. We go s/c but the food in the restaurent is excellent. Great for kids so much to do, the kids club staff are fantastic. It may be a little quite for some, and very hot in August. Lots of shades,and sunbeds,and the pools are the best I have ever experienced. Staff are very friendly and nothing is too much trouble. We will deffinately go back.